Overview: The syllabus, which acts as a contract with your students, presents an overview of the course description, goals and objectives; lists required materials; describes the schedule, assignments, and assessments; clarifies policies (including grading criteria) and expectations; and provides contact information. Though the syllabus is a contract, it should not be simply a list of prohibitions. Think of it as a communication tool, in which your students can read about your expectations of them and develop their ideas about their expectations for you and your class. Create a syllabus before the start of your course, but don’t stop there; continue to revise the syllabus—perhaps marking it up throughout the semester—to improve it for the next time you teach the course. What to include in a syllabus: Each course at UConn is unique and, as the syllabus is a reflection of the course and the instructor, each syllabus is unique as well. Contact information and office hours—List your classroom, office and office hours. Also provide all applicable contact information (phone numbers, email addresses, etc.). If you plan to use the email tools in HuskyCT, make sure you enable those tools and demonstrate their use on the first day of class. Course Description—Find a description of the course in the course catalog (undergraduate catalog; graduate catalog). The General Education Oversight Committee provides additional information on all Gen Ed courses. The description you provide in the syllabus may be a combination of these, with additional information about your unique course. Course Goals and Objectives—A well-developed course is designed around specific course goals and student-learning objectives; these goals and objectives should be articulated for your students (perhaps in a paragraph or a few sentences and a bulleted list) in your syllabus. If appropriate, express the importance of process (such as conducting research, writing drafts, or working out problems) as well as—or even over—product. Required Materials—Articulate all materials (texts, clickers, etc.) students will need to complete the course. 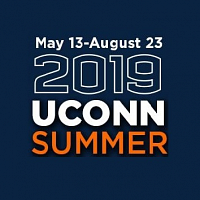 Texts are available through the local or online UConn Bookstore. Schedule—As you develop your schedule for the semester, always refer to the academic calendar. Also be mindful of religious holidays: Instructors are strongly encouraged to make reasonable accommodations in response to student requests to complete work missed by absence resulting from observation of religious holidays. Such accommodations should be made in ways that do not dilute or preclude the requirements or learning outcomes for the course. It makes sense to identify the schedule on your syllabus as “tentative” or “subject to change” and to discuss with students how they will be notified of schedule changes. Assignments and Assessments—The more detail you provide in these areas, the more informed and prepared your students will be. Policy Statements—Consider including specific policies in your syllabus. Post your syllabus. Students have an expectation that a syllabus will be available to them at the start of the course, so be sure that your syllabus is readily accessible. HuskyCT is a great place to post your syllabus. Check with your department first if you choose to print a copy for each student, as some departments do not fund such large-scale printing. Introduce the syllabus to your students. Introduce the syllabus to your students on the first day of class. If necessary, show them how to read the syllabus; perhaps even conduct a group activity (e.g., a syllabus scavenger hunt) or quiz to ensure that students have read and understand all components of the syllabus. [i] Weimer, Maryellen. “What does you syllabus say about you and your course?” Teaching Professor Blog, Faculty Focus. August 24, 2011.